HIBERNIAN made a miserable start to their Scottish Championship campaign as they went down 2-1 at Dumbarton. The home side made a flying start with Gregor Buchanan tapping home a low drilled free-kick from Willie Gibson inside three minutes. 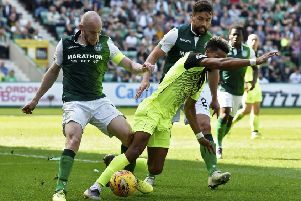 But Dominique Malonga showed good strength to chase a long ball before firing past Mark Brown to level in the 14th minute. The home side were twice unfortunate not to regain the lead when Garry Fleming hit a post before he saw his header well kept out by Mark Oxley. However, they did move 2-1 up 10 minutes into the second half when Gibson curled a free-kick into the top corner. Hibs dominated from then on but could not find that elusive equaliser.